When people hear the word archaeology, most think of Egyptian pyramids, Mexican temples, or the treasures of ancient Greece and Rome. If they are aware of North American archaeology, they usually picture archaeology sites far west of New England – 10,000-year-old early man sites on the Plains or the Southwestern pueblo cliff dwellers. They rarely consider Connecticut as the center of important archaeological activity. But it is. Connecticut contains thousands of pre-contact, post-contact, industrial archaeology, and maritime archaeology sites – Native American, Euro-American, African American, and other ethnic community sites. Many are thousands of years old. Historic residential and industrial sites provide clues to the various lifeways of the ancestors of today’s European-, African- and Native American residents, their interrelationships, and the cultural changes that may have modified those lifeways and relationships. Archaeological sites provide insights on fascinating and important stories about Connecticut’s cultural heritage that cannot be found in history books. Archaeological resources, however, are fragile and non-renewable. Many of the sites that will be featured on this web site have long since been destroyed. The only things left of these sites are the excavated artifacts, ecofacts, and the field notes describing their associations. Other featured sites are still extant but largely inaccessible to the public because of the risk of their being vandalized and destroyed by pothunters seeking “treasures” for their private collections, or to sell to other collectors. Educators, students, and casual visitors to the Web site can view the cultural remains from these sites and draw further conclusions about their meanings. Pothunters are unscrupulous collectors who wantonly vandalize archaeology sites and sacred burying grounds for the material objects they contain. The term was originally applied to collectors of Indian artifacts, such as the beautiful painted pots from Southwestern Indian burials. But it may also include collectors of non-Indian memorabilia, such as vandals of post-contact sites seeking old bottles, military items, etc. Unlike professional archaeologists and many amateur archaeologists, they do not dig a site according to scientific methods nor do they keep any records of their findings. Often their digging is surreptitious and illegal. Connecticut has passed laws that penalize such activities with fines and jail time or both in some instances. The State Historic Preservation Office (“SHPO”) maintains information on over 5,500 known archaeological sites within Connecticut. 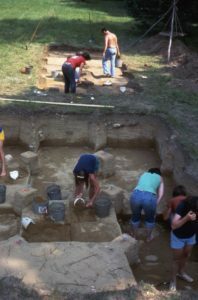 SHPO staff partner with the Office of the State Archaeologist at the University of Connecticut (Storrs), the state’s Native American community, avocational and professional archaeologists, and concerned citizens to manage Connecticut’s fragile archaeological heritage. There are now 31 archaeological preserves in Connecticut. Archaeology sites are so very important to the history of our state and they must be protected and preserved from disturbance and destruction. Once a site is destroyed by industrialization, suburban sprawl, or an uneducated treasure seeker, its story is gone forever.